Bhubaneswar: Odisha Chief Minister Naveen Patnaik on Tuesday approved 25 projects worth Rs 1.05 crore for three Gram Panchayats (GPs) in Keonjhar, Kendrapara and Sundargarh districts as part of the Ama Gaon Ama Vikash (Our Village, Our Development). 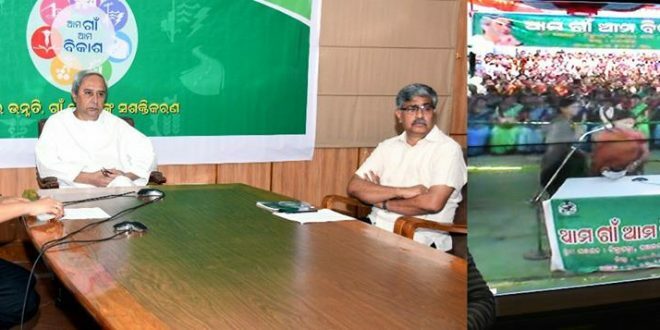 The Chief Minister interacted with people from gram panchayats (GPs) of Gadadharpur in Keonjhar, Rajagarh in Kendrapara and Mahulapalli in Sundargarh districts through video conferencing. Video vans were sent in advance to the panchayats concerned to facilitate the programme. He listened to their issues, concerns and necessities for development of their villages. Based on their suggestions and taking into considerations all proposals received, the Chief Minister immediately sanctioned 25 development projects worth Rs 1.05 crore. He also directed immediate commencement of all approved works and early completion. The Chief Minister is holding such interactions twice a week to discuss with the people at the panchayat level about the development of villages and pass orders as necessary.